Born in Florida, Stephen Lunsford emigrated to British Columbia in 1977, after attending graduate school at Ohio State University. He taught both at University of British Columbia and Simon Fraser University for a few years, before becoming a full time rare book and manuscript dealer, and an appraiser of the same. He has issued catalogues offering a wide variety of original manuscripts, photographs, printed items, and artwork. He specialized in unearthing hitherto unknown early works printed in Western Canada, especially indigenous language materials. For many years, he worked to discover and describe the earliest items printed in British Columbia, as well as the other western Provinces, Yukon, and Alaska. He amassed, in large part, the ground-breaking collection of BC Colonial imprints of John Keenlyside, as well as his own smaller collection of variants not found in the Keenlyside collection. Results of two of his bibliographical researches can be found in Amphora, the journal of the Alcuin Society: “Robert Mathison Jr’s Tasty Printing,” an account of Vancouver’s first job printer, in Special Issue of Amphora No. 150, November 2008, and “Pressing the Word into the Wilderness,” an overview of mission printing on the Northwest Coast. Amphora No. 154, Vancouver, 2010. This collection consists of materials related to early British Columbia history in the years when BC was still a British colony, prior to joining Canada in 1871. 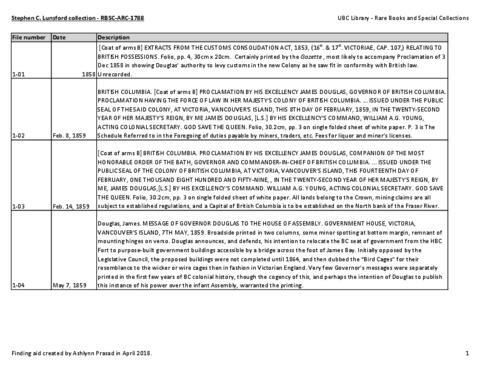 The collection consists of colonial government documents (proclamations, messages, acts, and rules and regulations) effecting the daily life of British Columbians. These include real estate titles, road works, railways, local, legal and financial matters, labour, and infrastructure. The collection includes proclamations by James Douglas, who was the first governor of BC and served from 1858-1864. Rare Books and Special Collections acquired this material in September 2015. Item-level PDF list is in chronological order, but the files have been left in their original (non-chronological) order by the archivist. Attached item level inventory created by Stephen Lunsford. Finding aid created by Ashlynn Prasad in April 2018.